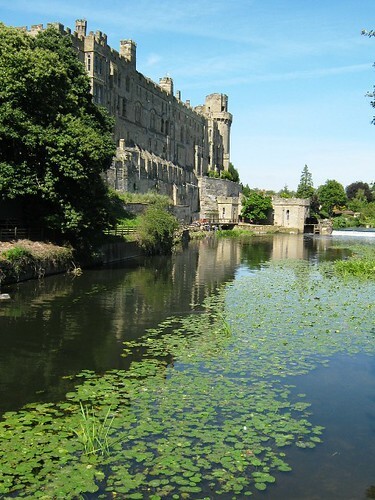 Warwick Castle, originally uploaded by gilfling. a casual step across the dining room..... my foot catches in my trouser turn-up...in an effort to steady myself and prevent myself falling, I try to do a dainty little hop, land my other foot on the vacuum cleaner sitting at the foot of the stairs (foot still caught up in trouser leg), completely lose my balance and end up with my entire weight falling onto the stairs with my knee landing on the wooden sharp edge of the step. Ouch. I will not be giving up the day job to be a stunt woman. So I spent most of the week in agony, contemplating an A+E (ER) visit, but just continuing to grit my teeth. It turns out to be just badly bruised with a bit of a gash, but oh my word! No climbing the loft ladders, no visits to my studio, alot of frozen peas and plasters, alot of knitting and crocheting, a few films. However our outdoor theatre experience to see Henry V was delightful, our visit to friends with new baby even more so and I did make it to my teaching job although driving with gritted teeth. Monday was just the most wonderful day. Marks birthday day out was a trip to Warwick Castle, with so much to do, gorgeous sunny weather, the most incredible birds of prey, a rather scary ghost experience, beautiful views and alot of fun. The end result of an unexpected injury and a 'life of leisure' means that I am a bit behind with doll-making, creating, painting. My accessories shop is bereft after another delivery to this gallery where my accessories have been selling quite well! So this coming week I shall be head down, stitching, sewing, painting and immersing myself in the things that I love to do most. After a wee while away from the studio, I am certainly feeling that pull to return and lose myself in paint and dreams and thoughts, characters and stories, texture and other worlds. It all awaits and I look forward to next week. I do hope you are enjoying summer, play, dreams and delights whatever they may be! Hope your knee is feeling better. I live in Kenilworth very near Warwick. Oh Gillian, I'm so sorry. I'm not sure if you know this, but I'm recovering from a horrible trip and fall and subsequent surgery in February (Just put on shoes two days ago). I'm so glad to know that your journey wasn't as damaging as mine. Take it easy, knit, watch some good movies and don't try to rush the recovery process. No long walks for a while. Feel better soon. I'm thinking of you and sending healing thoughts. ouch! when i read you delaying a trip to the ER i was thinking you an american (insurance concerns)... but with the Warwick castle hanging about don't think so! oh dear one, your poor knee...and you know me and knee pain, I am an expert. I would love to hear more about your ghostly visit, send me an email.